tanding on the prow of a 12-foot-long johnboat, wielding a trident and a waterproof car headlight (both on long poles), I helped to systematically slaughter 127 fish, a couple of which approached the state record in size and age. This was all perfectly legal, but I still feel a kind of post-mayhem remorse. Historically, sportsmen have viewed gar with an almost genocidal ire, holding a deep belief that these toothy, ferocious-looking fish are taxing on more desirable gamefish, like largemouth bass. But not Kent Edmonds. A native of South Carolina who attended Clemson University in the late ’60s (“where I majored in the Chattooga River,” Edmonds says), he is best known today as a Georgia-based striper and shoal bass guide who also holds an appreciation for gar. Few anglers can resist an actively working fish, especially one that will eat a fly, and invariably the clients ask Edmonds to sight-cast to the gar, fish that can measure more than four feet long. Although gar will hit an ordinary streamer, these often fail to stay attached due to the gar’s very bony mouth. Consequently, Edmonds ties a rope fly. To make a rope fly, start with a length of quarter-inch braided nylon rope (white is best, as it takes color from a permanent marker), and cut off about a foot. Pull the center core out of the rope and discard, then pass the hollowed-out nylon braid through a small stainless ring (available from many fly shops in the tying section). Clamp the ring in your vise or just hold it in your hands, and wrap the “head” of the fly tightly in strong, size A tying thread. Whip-finish the thread, apply stick-on flexible eyes, and coat the “head” in epoxy or UV glue. If you want the fly to sink or jig, you can place a layer of flat lead tape over the thread wraps before you apply the eyes. Use your bodkin or a nail to tease out the fibers near the back of the rope fly; eventually these tangle into a gnarly mass, which is perfect for holding gar teeth. 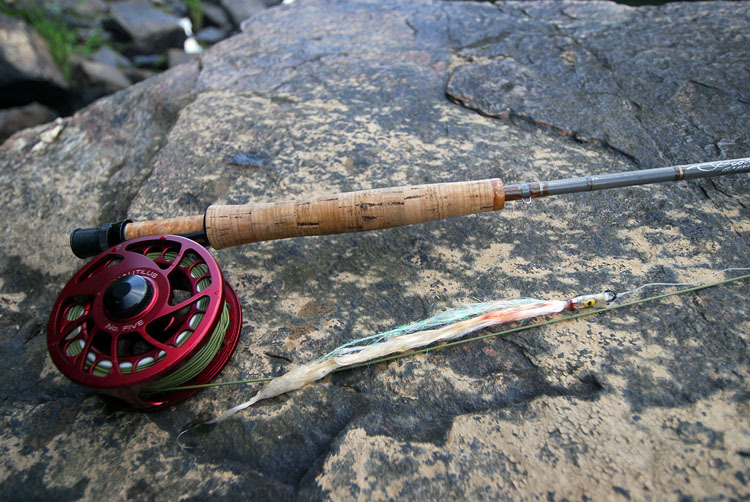 You can color the fly with permanent markers (many anglers favor a red section to indicate a wounded fish), but in all honesty gar will hit a plain rope with no decoration whatsoever. 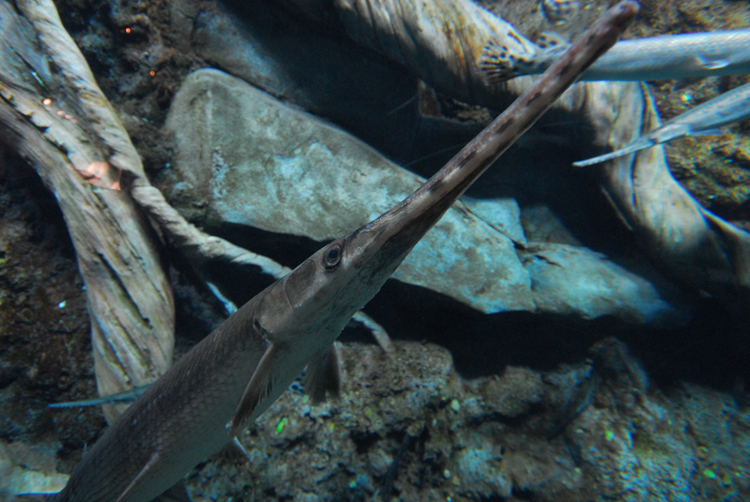 Gar are accessible for most of the warm months, but they tend to spend their winters down deep near the bottom of rivers and lakes. In summertime, the best tactic is to slowly float a river, or motor over a lake or pond, looking for the telltale long, dark shape of a three- to five-foot gar laid up near the surface. Once you’ve landed one, handle a gar, literally, with gloves: they are covered in a slick, protective layer of slime, and can destroy tackle if not quickly subdued. The best way to retrieve a rope fly for a clean catch-and-release is with a very long-jawed pair of needle-nose pliers. Spread the mouth with the pliers first, then carefully tease out the fly. Once freed, this interesting fish should be returned to the water to swim on—not tossed on the bank as so many anglers used to do. This article originally appeared in the Spring 2016 issue of Fly Rod & Reel magazine. 2 Responses to "Gar Water"
I pride myself in being the best angler when it comes in railing gar, but after I finished reading your article, I felt that there is still a lot to learn. Thank you for your clean article, I have learn so many new that I can definitely try it out in my next hunting. Thank you, and keep it up posting good article like this one. 3) get the rod tip high and hopefully it’s fish on. Of course this is not an exact science. I’m curious what you’ve found to work when it comes to tangling up with these guys.